The Intel Atom® processor C3000 product family is the next generation system-on-chip (SoC) built on the latest Intel 14-nanometer process technology. This highly-integrated SoC contains two to 16 next generation 64-bit Intel Atom® processor cores depending on the product SKU. The SoCs were created to address the growing needs for the emerging markets like Microserver*, Cloud ...Storage* and growing Communication Infrastructure market segments. 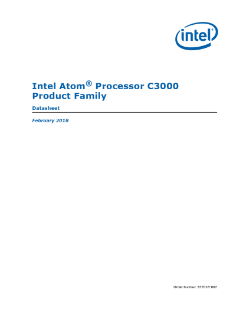 Note: Throughout this document, the Intel Atom® processor C3000 product family SoC will be referred to as simply SoC. Network and Enterprise Storage SKUs are targeted for long life supply and extended communications reliability. Four Extended Temperature SKUs provide operation over an extended temperature range. The parameter TCASE is mentioned in this chapter and is the temperature of the SoC package measured at the geometric center of the topside of the Integrated Heat Spreader (IHS).